Actually in the heart of the American Great Plains, these large prairie lands is a major agricultural and ranching area. First on the prairie were the native American Indians, including the Sioux, Pawnee, Missouria, Otoe, and Omaha tribes. The Indians first met the Europeans with the Spanish explorer Pedro de Villasur in 1720. He had traveled from Santa Fe into the Nebraska region and had battled with the Pawnee Indians. De Villlasur and his group lost and the spread of New Spain was hauled in Nebraska. A couple of French-Canadian fur-traders came in the 1730s, but no settlement. The French tried in 1794 with a trading post as if an American trader by setting up Fort Charles. Even with Nebraska part of the 1803 Louisiana Purchase by the United States, little settlement took place until the 1849 gold rush further west. With so many pioneers traveling through Nebraska, additional forts providing protection and services for the travelers were set up. By 1854, Nebraska was made a territory. In the 1860s the number of new settlers greatly increased as they claimed the free homestead land of 160 acres. In reference to these early pioneers, it is interesting in Nebraska genealogy to note, that most settlers had to have sod homes because so few trees existed in Nebraska. 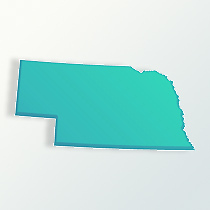 By 1867, Nebraska became the 37th state. With the railroad system, bring former Civil war soldiers and immigrants from Europe there was now thousands of people to take up land in Nebraska. Most of the great Montana cattle ranches that had grown up near the ends of the trails from Texas gave way to farms. Large groups of Germans and Czech arrived in the 1890s to Nebraska. The change in the state’s population increased during the late 1800s, a special note in Nebraska genealogy. In 1860, Nebraska’s population was about 28,800 people, by 1870 it was 122,990 and by 1880 was 452,200. In the 20th century, Hispanics were drawn to Nebraska by the labor shortages of the 1940s, but large scale migration began in the 1980s and 1990s, reaching cities large and small. The population of all of Nebraska in 2009 is about 1.8 million. Those of German ancestry live mostly in the eastern side of Nebraska. Czech descendants in Nebraska make up one of the largest Czech groups in the country. Also, whose families immigrated are from Ireland, Scotland and England. The African-American population is about 4.5 percent. There are the Omaha and Winnebago tribes, two of Indian reservations in Thurston County, Nebraska.